Google are always trying to be helpful. Last night anyone on iOS with the Google Search app installed would have been offered an update to version 3. 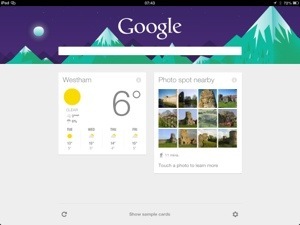 For some time now Android users have had a few extra features in Google Search compared to those on iOS. Not surprising and really to be expected as Google provide the Android OS. 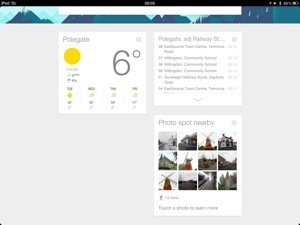 Google have ported the Google Now service onto Apple iOS. As far as I can tell nothing else has changed on Google Search. Google Now is a location based automatic search facility. It uses your location to provide some useful information. Weather is the obvious one but also the app description says it will provide traffic, local sports and so forth. What is a bit weird is the “background” element to this app. As with all Google features, if you sign in to a Google account then you’ll likely get a more honed service for you over time. The first thing is that this app is both iPhone and iPad capable (universal). It requires iOS 5 or above. Google Now uses the Location information provided by iOS and thus requires this to be both on and enabled for “Google“. To disable either “Location Services” (or just “Google” using them) then simply follow the instructions above and ensure it is marked “OFF“. Loading the app for the first time you’ll get a quick video on how Google see the app taking over your life. Once in you are provided the normal Google Search bar. This hasn’t changed. 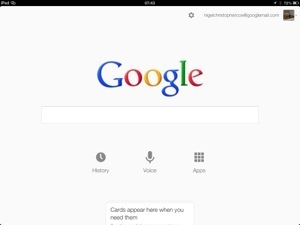 Search results open directly in the app as tabs which can be swished out of sight (to the right) or deleted. 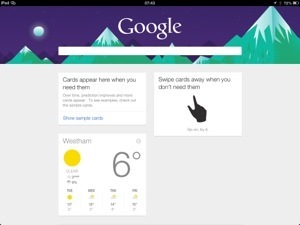 Google Now is accessed by simply swiping UP on the app. You will see a few introduction cards (as the elements are called) informing you of how the service works. Swish any card to the left or right and it is removed from your view. At the bottom is a button marked “Show more cards”. That is where most things, other than weather come to life. Everyones experience and mileage from this app will vary. It depends how much you use the Google eco-syste, where you are and above all how much you are willing to “play” with the feature. What I found was that very little information was actually provided. I got information or the following as I wandered from town to town. If you are on GPRS then you’ll find the most common answer is “Check again soon”, it appears the timeout is a little harsh. But that is better than the app eating away at your data allowances constantly. I also found that on GPRS (and occasionally at other times) the results tabs loaded entirely blank. Quite annoying. This was true of normal search results as well as those from Google Now. Here are some of the results I achieved. Make your own mind up whether they look “useful, my notes are below. Google are always innovating but I’m not sure about this one. I’m not a fan of G+ and this feels similar in its planning. The GPRS failures make the Google Now system far less useful. The App appears to enable “Location Services” permanently in iOS. There is a notice in the app description in App Store related to battery life and that the app does not use GPS but “passive updates from nearby cell towers and WiFi hot spots” but as I cannot confirm any of that I can only tell you what I see. When this app is enabled for “Location Services” the “Compass Arrow” indicating Location Services are in use comes on permanently. It does not matter if you push the app into the background, close it or even turn the device off then on again. “Location Services” stay permanently on. Exactly the same as with Apple Reminders with “ring fencing” enabled. This has worrying implications for battery life and I would much rather this app ONLY enabled location services whilst it was in the foreground please. I also found I got the “Check again soon” failure message the vast majority of the time. Plus, how local is local? This is not configurable so, as with G+, “local” can mean many dozens of miles away. This needs to be configurable, Google. Even a running option actually, as a users idea of local will depend on circumstance. If in a car then they will maybe want the wider search, on foot they’ll want just the closest of matches. But I am guessing that this would show up how poor the results are for very local searches outside of the US Big Cities. I will be disabling and ignoring this feature but will probably try it from time to time.